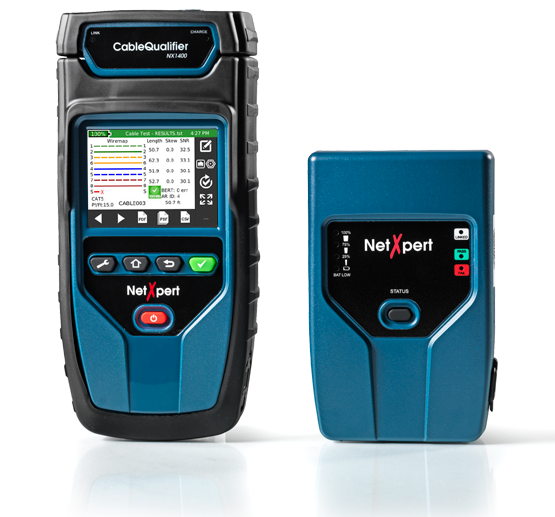 The NetXpert 1400 provides a complete solution for cable qualification and troubleshooting of active networks, enabling rapid, simple verification and documentation of the capability of cabling links to support Gigabit Ethernet operation compliant with the IEEE 802.3ab standard. Irrespective of the category of cables and connectors installed, a “Pass/Fail” result indicates whether the existing cabling can support data rates up to 1Gbit/s. The NetXpert 1400 is a cost-effective alternative for installers and operators of network cabling systems where qualifying cabling bazndwidth up to Gigabit Ethernet is sufficient. The NetXpert allows users to verify whether cabling links will support a maximum data rate of up to 1Gbit/s irrespective of the category of the cables, patch panels, or outlets installed. Performing standards-based tests with real data as per IEEE 802.3ab and bit error rate tests (BERT) the NetXpert 1400 tests the error-free data transmission at 100Mbit/s or 1Gbit/s. Adding to this, parameters affecting signal quality can be displayed including signal-to-noise ratio (SNR) and delay skew. Delay skew in a 4-pair cable indicates the signal time delay between pairs and can impact Gigabit Ethernet performance. Continuity test results of all 8 wires and the shielding are displayed in wire map format in full colour while showing cable faults such as opens, shorts, miswires, and split pairs in a clear and easy to understand way. Cable length and distance to the cable fault are determined using advanced TDR (Time Domain Reflectometer) technology. 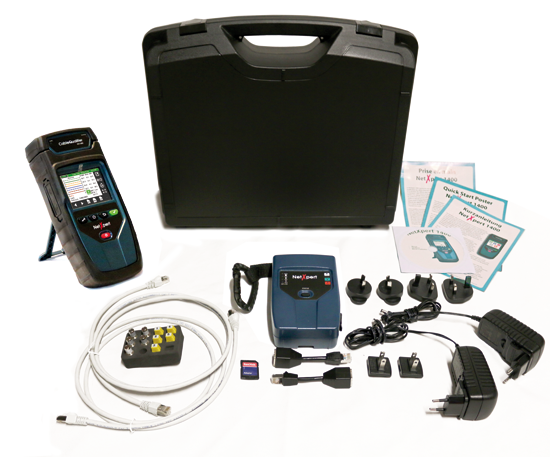 The results can be saved in the NetXpert 1400 and full colour reports can be generated for documentation purposes. Featuring a bundle of network testing capabilities, the NetXpert 1400 assists you with verifying network configuration and troubleshooting networks as any moves, adds & changes (MACs) performed will require a renewed verification. The NetXpert 1400 verifies, when connected to a communications outlet, if a link can be established to the switch and which connection speeds are supported (up to 1Gbit/s). The Ping test detects the availability of individual and lists of IPv4 and IPv6 addresses and any user-selectable URLs. On top of this, the user can choose from a range of other network tests, such as LLDP/CDP/NDP and VLAN discovery and comprehensive PoE (Power over Ethernet) tests, including a load test. The full-colour touch screen and another 4 buttons make the NetXpert 1400 easy to use while the high- resolution colour screen guarantees excellent readability in any environment. Its ruggedized design is ideally suited for rough handling environments. The generation of detailed test reports and documentation is possible directly on the device.